Time. In the end, that’s one of the few things you have, and precious little of it. A “job” simply takes too much time away from everything else that matters; family, friends, community, health, the land, and so on. A job is what I call a “mutually exclusive circle,” which is to say that usually, your family, friends, the community, your health, and that of the land, are not a part of it, they’re not inside the job circle. Where does that leave those people and things? Earning money at a job is taxed heavily, relatively speaking. That means that what you earn is significantly devalued simply by virtue of how you earn it, especially if that something results in a W-2. The Feds take a big fraction, the States follow suit. Then, most of what you buy with what you earn is also taxed, the earnings on your savings, if any, are taxed, etc. And let’s not forget the systematic devaluation of the dollar. All-in-all, it’s a Win-Lose proposition, and the earner/saver is not on the Winning side of the equation. Resiliancy? Not. With a single-point source of income you are generally employed at the whim of your employer; it’s called “at-will” employment; your will, and more importantly in this context, your employer’s will. You can be let go for more or less any reason, or no reason at all, eliminating your single-point source of income. Passive income. Nope. With a job, typically, if you don’t work, you don’t get paid. Especially as we age, it is important to have streams of income that do not require our active participation. You know, like book royalties, or rent from that spare space in your barn; gifts that keep on giving. At least that is the belief system I operate under. So what does that mean? Mortgage(s), Rent, Property taxes (if paying monthly), Home/Personal Property insurance, etc. Of course the list is incomplete, but you get the idea. What can be done? Plenty. I’ll run down the list and offer a few examples. Mortgages, and other home-related costs. Of course you could rent instead of own, and many do, but the fact is that the Feds invest heavily in reducing the costs of ownership; this via subsidies of course, by guaranteeing payment of your loan through Freddie Mac and Fannie Mae, and by the Federal Reserve investing in primarily two things, government bonds/notes and mortgage-backed securities. Do the math. If you own, you can choose to do as many do, including us, and make extra prinicple payments. Extra principle payments increase current costs obviously, though the increase is at your discretion, but they also have the effect of reducing interest payments on the remaining principle, and of shortening the term of the loan. Groceries. For us, this is a big expense, primarily because we choose to eat the best food we can afford. Organic, pasture-raised, cage free, all those buzz-words apply. We started by buying grass-fed beef and pastured pork on the hoof; know where your food comes from. Go local. That was a huge discount on store-bought meats of the same quality, if it is even available in stores. Hunting and fishing are not for “sport;” they put food in the freezer and on the table, at low cost, and are of high quality. Gardening, same deal. Better food for less money. Get after it. Utility bills. Big for us, and big for most people living in temperate climates, is the cost of heating the home, and hot water. Our hot water soaked up gobs of cash for payment of electricity bills; heat did the same for payment of propane bills. We invested in an on-demand hot water heat, still fired by propane because it is far less expensive per BTU than electricity, BUT, you are not heating the water in your traditional hot water heater 24/7 regardless of whether or not you are using it. Big savings. For heat, we invested in a wood-fired “outdoor wood boiler;” effectively then we heat the house with wood, the energy is moved from here to there via hot water. We have more deadfall than I can possibly keep up with, and the wood replaced most of our demand for propane; a huge savings. Also, we invested some money, but mostly time, in buttoning up the house a bit better, to reduce heating requirements. There is more work to do on that front. Another big savings for us, we don’t “do” TV, or cable more generally. We’ve done without TV for so long now, that I cannot imagine how I got a damn thing done when we did have it. Of course, that says more about me than it does about TV. Vehicles (auto payments, insurance, etc.). First and foremost, never, ever buy a new car. Cars lose value, they are an expense, not an investment, unless you are using it in a business. We all know how the value of a car drops the minute you drive it off the lot. If you do buy a new car, pay cash, don’t borrow against a car that will be worth less than what you owe on the note in just a few short years. I have always said, if it costs more than $20,000 it should have basement. I’ve never spent more than $20k on a car, and I’ve only bought a new car once, that when I worked (single-point source of income) for a car company, and was granted a significant discount on the purchase. Even that new car did not come to $20k. Let someone else take the loss. Second, maintain the vehicle, especially the fluids and tires, but the body as well. Do it yourself if possible. Then, run ’em til the wheels fall off, which should be a long, long time. on 4 Recommendations for Radically Improving Health; getting into or staying in action on your health is entirely up to you. And be safe, don’t get hurt; no one can afford to be seriously injured. As Mark Sisson says, “Live long, drop dead.” Preferably in the woods, where the critters will take care of the burial at no cost to my survivors. I’ll stop there; it’s feeling too much like a rant, which in part it probably is. Oh, but one more thing, if you have money in what was formerly known as a “passbook savings account,” your money is worth-less, every day. You can thank the Federal Reserve for targeting an inflation rate of 2%, while you earn far less than 1% on your savings. It’s a system that is financially punishing to those least able to absorb the punishment. ‘Nuf said. Perhaps too much at that. Check your local library, or check out abebooks.com for used copies on the cheap. That’s not a paid endorsement; a great friend turned me on to Abe Books. So much to learn, so much work to do, and those are blessings. 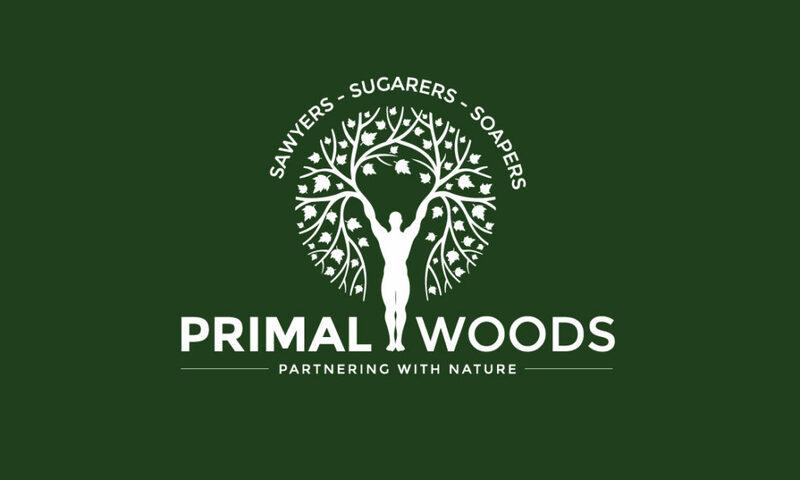 If you are reading this, you might know that Primal Woods is made up of three pieces; Primal Woods Sawyers, Primal Woods Sugarers, and Primal Woods Soapers. That was based primarily on what the land gives up as part of its nature; wood, sap from the Sugar Maple, and ashes from burning the wood. As a side benefit, it results in multiple streams of income, largely unrelated in terms of the markets served. I have also noticed, since we are living more rurally and closer the the land ourselves, that for people doing similarly minimizing expenses and developing multiple streams of income is the rule, not the exception. On a side note I suppose, the businesses are also seasonal, that’s in keeping with the seasons, if you can imagine that. Historically, logging was a winter-time activity, because the frozen earth made it easier to move the logs to the nearest navigable waterway, where they lay until spring when the ice broke on the rivers. Spring was the Sawyers’ time, milling, when the logs were floated down-river to the mills. Our milling season now runs April through December, mostly because it’s too wet earlier to move heavy equipment around. Sugaring, at least the Maple Syrup portion, runs February-March in our neck of the woods. Sometimes from late January, sometimes into early April. Honey harvest is in late summer or early fall, August-September let’s call it. Soapers worked in springtime traditionally, after the winter (wood) heating season, using the ash from those fires, and the fats saved from cooking; nowadays we can make soap year round, but I expect to push hard on the Soapers business this spring. It’s hard to say with certainty, but 2018 looks to be about evenly split between Sawyers and Sugarers income; Soapers is lagging, which is no one’s fault but my own. The beauty of syrup and soap is that it can be made in quantity and sold year-round, whereas if I don’t work, there is no Sawyers income day-for-day that I’m not working. You might have also read about “the Box,” and we are also working on an “adopt-a-maple” program, that are ways to offer additional Value, and to generate additional streams of income. I suppose it goes without saying, but we are not running a non-profit. It is our goal, Our Purpose, that our customers find Value in our offerings greater than the cost of those offerings. As we make this “massive lifestyle change,” Geri is working “off-farm.” It is unfortunately another necessary stream of income. Frankly, and I think I’ve said this before, this is to preserve working capital for Primal Woods. We are reallocating our resources to Primal Woods, to build the business, and our future. For Geri’s sacrifice I will be forever thankful. The “plan” is that by the end of the first quarter of 2019, Primal Woods will bring in enough income to sustain us. Wherever that point in time may fall, Geri will have the choice of continuing to work off-farm, or to come home to Primal Woods. The deciding factor will probably be whether or not she can put up with me! Which, it should go without saying, is a tall order. Making a living. It’s not much without life. And that life is what I hope we are bringing to the business of making a living. My apologies for being so long-winded; guess I had a lot on my mind. And thank you Marcelle, for taking the time to comment. I really have no complaints. It is a lot of work, and no end in sight, which I am absolutely grateful for. To “retire” is to shave several years off of one’s life expectancy, and I’m not up for that! There are a lot of less glamorous things that need doing on a regular basis. The vast majority of it I enjoy. And it’s fulfilling to day-by-day, provide more for oneself. I’m outside probably 75% of the time, in a truly glorious location. We are blessed to be able to do what we are doing. I love what you are up to. I will carry your wishes to Geri, and thanks again. In your travels, if you ever get to the midwest, let us know. Subscribe to Our Blog and Newsletter!